I have a person doing work practise with me until March. It’s proven the best way to get productive! Monday we packed the bike trolley and ventured down the beach to do wet plates. It was very wet indeed. The air was so cold and clammy that the glass plates kept steaming up but we managed some good plates in the end. Back home we warmed up in the darkroom and made contact prints from the wet plate glass negatives that I made in the studio over the weekend. One is a definite keeper, I think I’m becoming addicted to tulips. Today the plan was doing more prints in the darkroom but the weather was just irresistible. Sunshine and everything covered in frost. So we went down the beach and the nature reserve with some old cameras and my favourite pinhole camera. Just stunning! I got my mind set on a picture I wanted and ended up getting my feet wet. 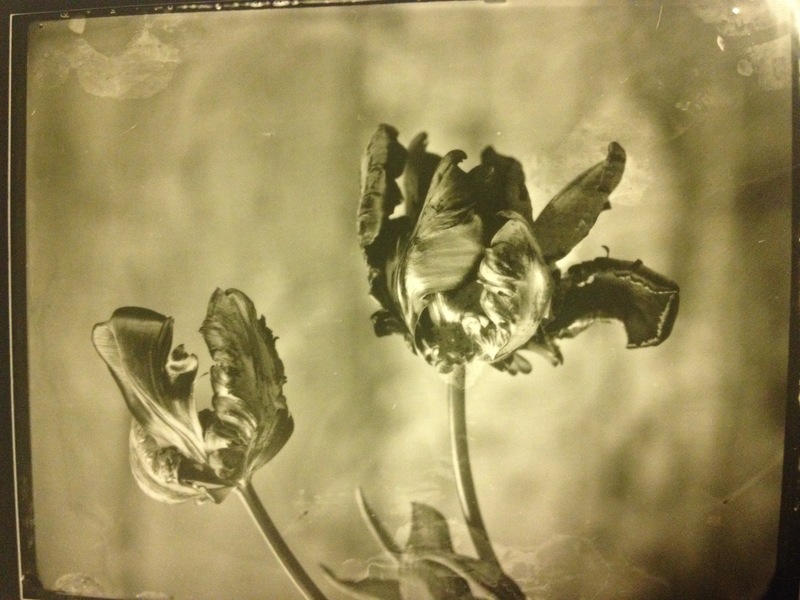 Haven’t developed the pinhole negatives yet but I’m sure it was worth the pain. Happy, sunny and hungry we returned to develop some rolls of film in Caffenol. This is my favourite way of developing using only coffee, washing soda and vitamin-C, no bad chemicals. Even though I enjoy working on my own it felt great to share the day and also having an assistent on hand. I have a feeling February will be a very productive month!